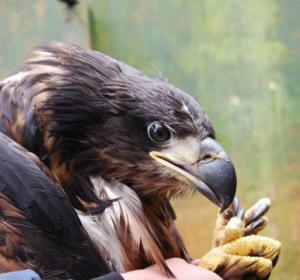 Aoibheall was hatched and reared in the wild in Ireland at a nest near Mountshannon in east Clare in 2014, only the third White-tailed Sea Eagle to fly from a nest in Ireland since the reintroduction programme began. 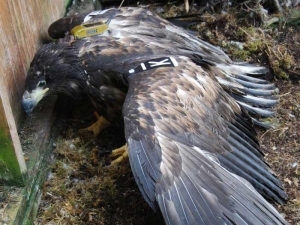 Aoibheall is a young female, the only chick in her brood in 2014, and carries the number 2 on her wing tag (orange tag on the left and purple tag on right wing). 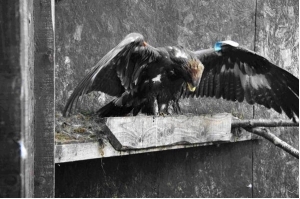 She flew from the nest on 26 July at over 12 weeks old and over the next few months remained in the area of her nest site where she has been attended to and fed by her parents: 2008 red tag male Caimin and 2009 green tag female Saoirse. 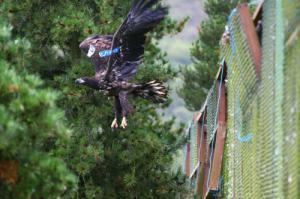 Caimin and Saoirse also nested in 2012 and 2013, rearing two chicks successfully in 2013. 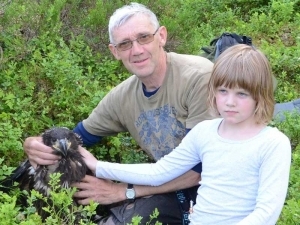 Both Caimin and Saoirse were hatched in nests on the island of Frøya, Norway, and were collected under licence and released in Killarney National Park, Co. Kerry. "According to the author of the Cogaidh Gaeil re Gaill a supernatural female, Aoibheall of Craglea, near Killaloe, the legendary patroness or Badhb of the Dal Cais appeared to Brian Boru in his tent on the eve of the Battle of Clontarf to forewarn him of his death on the following day. Sean Mac Craith, the fifteenth-century chronicler of the wars of Turlough O'Brien, refers to another female - a washer of blood-stained clothes - who appeared at the most turbulent and life-threatening times in the life of his hero. Thomas Westropp found that belief in this tradition was still extant until well into the present century. A local legend in the Dysert area told how Aoibheall and twenty-five banshees washed blood-stained clothes in Rath Lake on the eve of the famous battle in 1318 at which Richard De Clare was killed, and that they still do so in times of crisis." 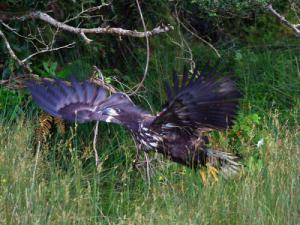 Aoibheall the White-tailed Sea Eagle can be followed on our website and on Facebook (Golden Eagle Trust). She carries a satellite transmitter that we hope will be able to track her movements over the next few years, hopefully right up to the time she herself starts to nest in the wild! 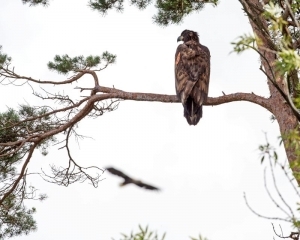 Because locations such as roosting and future nesting sites are sensitive to disturbance by humans we will be showing her general (daytime) movements only. Her satellite transmitter is solar powered so although we receive multiple GPS locations in summer, by mid-winter this is down to only two locations as the unit is programmed to do this to save battery power. Female @ was collected at 1302pm on the second day of our collection trip in Wales, the 7th June 2011, from a huge Oak tree in an area called Llanboidy in Powys by Tony Cross, from the Welsh Kite Trust. Tony expertly climbed the tree and found two chicks and an unhatched egg. Female @ was the smaller of the two chicks on this occasion and her sibling was ringed and wing-tagged (Black 12) by Tony at the nest. Female @ was lowered carefully to the ground team; Marc Ruddock, Douglas Ruddock (my dad!) and my good friend George Henderson. The wood was unforgettable and was covered in blue-bells which in June just formed a slippery mat of green which we all slipped and slid along on our way towards and again back from the nest. I nearly fell over onto my face at least once, much to the amusement of the others! 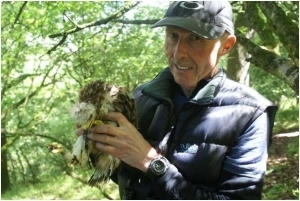 Female @ weighed 795g when we collected her in June and a massive 1060g when we ringed and tagged her on the 22nd July 2011. 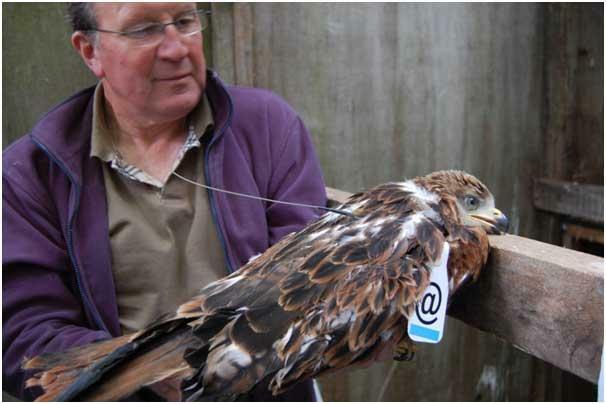 Female @ was fitted with a 12g solar powered satellite transmitter by Brian Etheridge, who is the raptor monitoring officer in Scotland; Brian also manages the Northern Scotland Red Kite project on the Black Isle for RSPB Scotland. 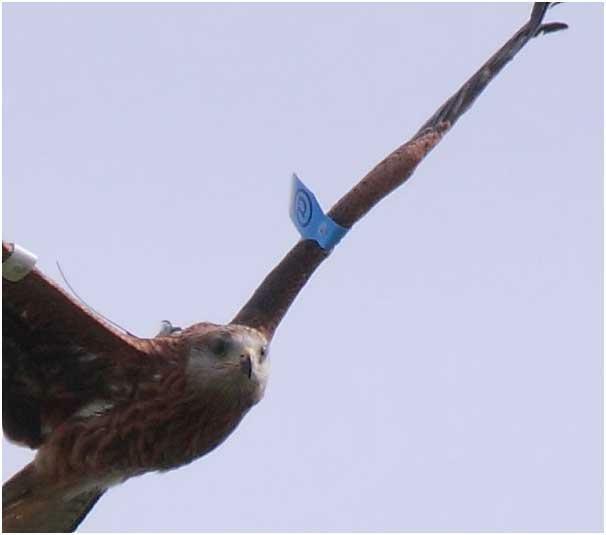 Female @ was released along with the other 25 kites from the Newbridge cages on the 26th July and was seen regularly around the release site for the first few weeks. Some of the photographers got some great photos of her shortly after release.